HARDWARE: The Future Is Loud, Abrasive And Very Showy – Schlockmania! For years, Richard Stanley was more famous for his bad luck in getting his vision to the public than for his films themselves. Hardware and Dust Devil were recut by distributors and he didn’t even get to finish The Island Of Dr. Moreau, ultimately being replaced by John Frankenheimer. Thankfully, his work has gotten a chance for re-appraisal via DVD: Dust Devil was the first to get an uncut, director-sanctioned reissue via the sadly defunct Subversive Cinema label and now Hardware has gotten an uncut release from the good folks at Severin Films. Unfortunately, it might not live up to the hopes that the uninitiated might have for it. The plot seems straightforward enough when looked at in synopsis form: Moses (Dylan McDermott) is scavenger who roams the wastelands outside a post-apocalypse New York for a living. He picks up any metallic junk he finds and either sells it on the black market or brings it home to his sculptress girlfriend, Jill (Stacey Travis). A skull-like robot head, along with some related parts, come into his possession and he brings them home to Jill, who promptly adds it to a sculpture. Unfortunately, said robot head is part of a M.A.R.K. 13, a prototype warfare robot. Said robot has the skill to reassemble itself and resume pursuing its directive… which is, KILL! KILL! KILL! It’s a serviceable premise and could have made for a crackerjack sci-fi/action hybrid but that is not what Stanley had in mind. Instead, Hardware is a hymn to cyberpunk concepts, post-punk music (with an accent on industrial) and lysergic music-video imagery. The film is packed with interesting ideas and Stanley works visual fx/production design wonders on a fraction of a Hollywood budget. It even boasts cameos by Lemmy of Motorhead and Iggy Pop, who is very funny in a voice-only role as nihilistic, jive-talking d.j. 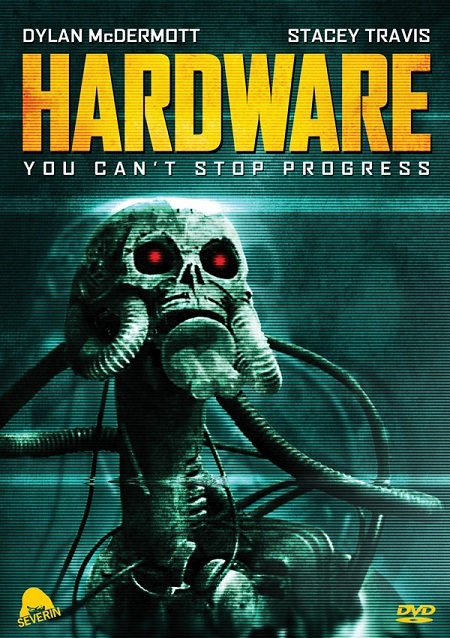 It a film could succeed on ideas and ambition alone, Hardware would be a four-star classic. That said, a film also needs to be dramatically compelling to fully succeed and, to Your Humble Reviewer’s eyes, Hardware is not. The script lacks any sort of dramatic thrust, languishing for forty minutes of atmospherics before finally getting its plot in gear. To make matters worse, most of the characters come off as unpleasant, annoying or both. Stanley directs his tale with plenty of style but he’s content to let that style take the place of storytelling: the camera swoops around, the fast edits hit with a punch and Simon Boswell’s impressive orchestral/electronic-fusion score blares but they seem to showboating for the glory of making something that looks and sounds cool instead of applying themselves to the needs of the storyline. Next ArticleSchlock-Wire: Shout! Factory Brings Corman Back To DVD With Special Editions of Suburbia and Rock “N’ Roll High School! Schlockmaniac #1, alias Your Humble Reviewer. The person behind this affront to High Culture is Don Guarisco. He has a BFA Degree in Film from Florida State University and has written professionally about pop culture for over a decade. 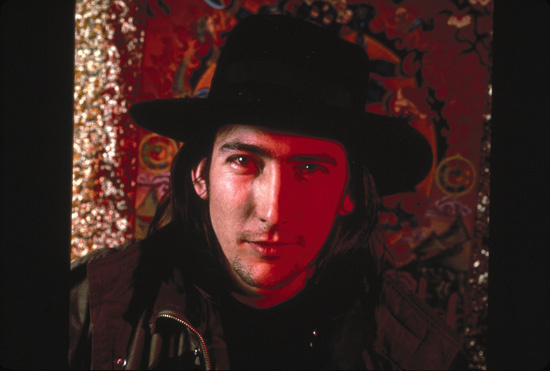 His work in the online arena includes reviews and essays for Yesterdayland (now known as Retroland), All Music Guide, All Movie Guide, AVManiacs and The Temple Of Schlock. His reviews have also been published in several All Music Guide publications and DVD Delirium 3. Schlock-Wire: Severin Bringing HORROR EXPRESS To Blu-Ray And DVD In November! Hmmm, I think that back in 1994 when I was into Cyberpunk it would have been cool. But it’s been a long long time since anybody has done a cyberpunk flick, just as long as it’s better than Johnny Mnemonic. Maybe they should to re-introduce something new to the teens of today. The new Mad Max anyone? Enter your email address to subscribe to Schlockmania and receive notifications of new posts by email. Schlockmania’s Five Favorite Larry Cohen Movies – Schlockmania! on MANIAC COP: Law Enforcement From Beyond The Grave?